The first substantial New Zealand mountain to be climbed by Europeans was Mt Sparrman in Dusky Sound, by three of Captain James Cook’s men during his second voyage to New Zealand in 1773. 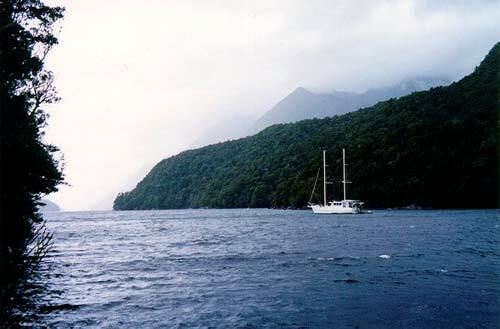 In 1999, the Australian art historian Bernard Smith was among a group in the boat Breaksea Girl to Dusky Sound to recreate Cook’s visit. The boat is moored in the sound, with Mt Sparrman partially hidden by clouds.